Story Link is a part of St. Vincent de Paul Southwest Idaho. The program has volunteers go to the prisons, where incarcerated parents and grandparents read children’s books and sign them with a message of endearment. A recording of the inmate reading the book, and the signed book, are then mailed to their child. This ministry is only possible through generous donations and volunteer work. Story link has 29 volunteers and has served 6,683 inmates over its seven-year history. Story Link Idaho was founded by Mary Ann Kojis in 2011. She was inspired by the efforts of Dana and Jane Abendschein in Missouri. The Abendscheins were clowns at family days in the Missouri state prisons up until the family day program was ended. 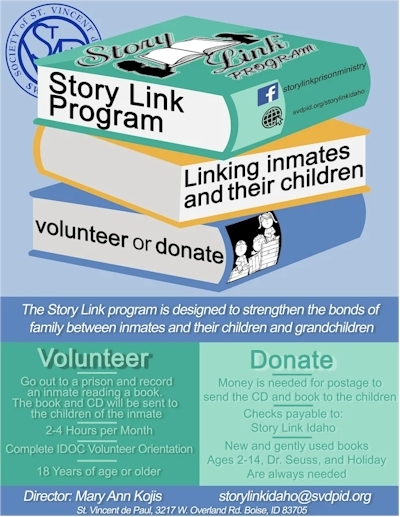 They began a Story Link program there to maintain a link between incarcerated parents and grandparents and their children. That model, combined with inspiration from being a first-grade teacher, having family incarcerated, and a love of Jesus Christ convinced Mary Ann to begin Story Link Idaho. She feels it is her calling from the holy spirit to pursue this ministry. To keep serving almost a thousand inmates a year Story Link needs your assistance. Volunteers are needed both going into the prisons and processing the stories out of the prisons with a whole host of tasks to make Story Link successful. Financial contributions are also crucial to operating the program. Check out the image above for more details on how to help or contact Mary Ann Kojis at storylinkidaho@svdpid.org.